Bill and Linda Engel "Saviors of Sleighs"
The term "saviors" has been applied to us by many. We try to maintain as much information about a sleigh as we can. Some people have even "willed" us their sleigh(s) for safe keeping. Tradition is something that is very important. Kids need to know how things used to be. As a former college professor, Bill doesn't mind giving an occasional "sleigh" history lesson to anyone who will listen. With the arrival of our first grandchildren (twin girls), Bill decided to buy a piece of history to share with them. He fell in love with grandchildren and sleighs at the same time. 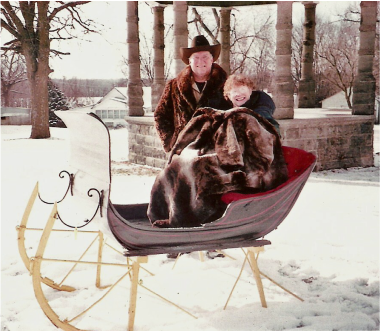 We have added both grandchildren and sleighs since then. So, where are we? Well, Denver, Missouri is nestled in the rolling hills of North Western Missouri approximately half way between I-35 and I-29 near the Missouri - Iowa border.